You are currently browsing the Laurie Klein Art — Laurie's Place blog archives for December, 2011. She made her first Christmas card appearance in 1989, sharing the drawing with her great grandmothers, Nana and Nonnie. She subsequently featured in 6 more holiday greetings, the last celebrating her pending graduation from high school and the as-yet-to-be realized adventures in college (Christmas 2006). Now it’s 2011 and there’s been another graduation (okay, i STILL, can’t believe 4 years went by that fast) so, naturally, this year’s card needed to once again spotlight Jesse. The best Companion a mother (or Time Lord) could ever have! Wrapping up her senior year at NYU, finishing her last two classes in a study abroad program at Trinity College in Dublin, followed by what i affectionately call “The Mother/Daughter Magical Mystery Tour of Time & Space (w/ Nerdy Geek Encounters in) Ireland, England & Wales” ~ it’s ALL here. Well, in the symbolic and convoluted way i depict things, which, of course, necessitates the customary Explanatory Notes/Background Syory portion of a Laurie Allen Klein Christmas card. So sit back, relax, pour yourself a Guinness and enjoy. Slainte! The setting is a pub (and – no – not for the obvious reason, though Irish pubs did indeed get a fair workout). Jesse and i took a Musical Pub Crawl through Dublin that turned out to be wonderfully educational (as opposed to simply an excuse to get wasted) and we learned, among a variety of things, that if the place looks like someone’s livingroom – you’re in a real Irish pub – so that seemed like the perfect setting for a picture that is not only part autobiography but also a holiday celebration The other thing we learned on the tour was – Irish music is taken very seriously. There are, certainly, those places where folks just go to booze and watch football and sing badly to Top 40 songs, but the real pubs are home to serious musicians who drop in with their instruments and just start jamming – ebbing and flowing, picking up the theme and playing with it before relinquishing it to the next instrument. There is drinking, but more importantly there is always a corner of the pub reserved for the communal spirit of music and singing and sharing stories. And as with all good jam sessions, my musicians tell the story. Jesse’s in the middle, wearing the scarf that features in just about every photograph taken of her the past 4 years, and she’s playing a Clarsach (harp), a traditional symbol of Ireland. 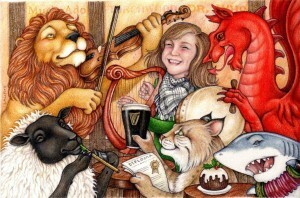 On the fiddle is a lion, representing England, and playing the bodhran (drum) is the Red Dragon of Wales (the other places we visited on our travels). The sheep plays the tin whistle and represents Ireland because Jess saw so many on her trip (and is just mad about them). From New York, hoisting the pint of Guinness and holding Jesse’s diploma, is the NYU mascot (NOTE: the other two pages in the bobcat’s paw are the certificates Jess and i both received from the old Jameson Distillery, certifying us as “Qualified Irish Whiskey Tasters”). Which, finally, brings us to the shark who probably needs no explanation if you are familiar with Klein family obsessions in general or Jesse’s in particular. That’s Bruce, the shark from JAWS. Jesse got the movie when we moved to Florida 14 years ago and it has been a favorite ever since, so much so in fact that not only did Jess take a copy to college with her, it was the only DVD she specifically took to Ireland as well. From a holiday standpoint it also happens to be a family tradition to watch the movie every Christmas (or the wonderfully awful Jaws 3 in 3D) but i have long forgotten how that started. The Christmas pudding has no symbolic significance other than this is a Christmas card and i wanted a holiday reference but, truth be told, it actually wound up there because i had an empty space beside the bobcat and needed to fill it with something. Of course no trip to Wales and England would be complete without indulging our other Mother/Daughter fixations, manias and obsessions and those too are represented in the card. In Cardiff, Jess and i went to the Millennium Centre – home of the Time Rift and secret entrance to the Torchwood Hub; and in London we enjoyed the Doctor Who Experience and saw David Tennant and Catherine Tate (the 10th Doctor and his companion Donna Noble) in “Much Ado About Nothing” so those names are painted on the pub wall. “Galway Girl” is the name of of one of the songs on Jesse’s Irish play list that she listened to a lot (tho, technically, not a traditional Irish pub song it was a favorite and she really liked Galway) and Jesse is, and always has been, mysterious… and stuff. May your heart be warm and happy, with the lilt of Irish laughter, Every day in every way, And forever and ever after.